For those of our readers familiar with the tale of Goldilocks and the Three Bears, you’ll likely remember Goldilocks’ famous “just right” comparison. Now of course Goldilocks was really referring to beds that were too soft and porridge that was too hot, but we’re pretty sure if our little friend was trying on running shoes, she may have described the PureConnect 3 from Brooks as “just right.” We think the PureConnect 3 is a great option for those looking for a shoe that’s lightweight but not quite minimalist. One of our editors has been a long-time Brooks fan. 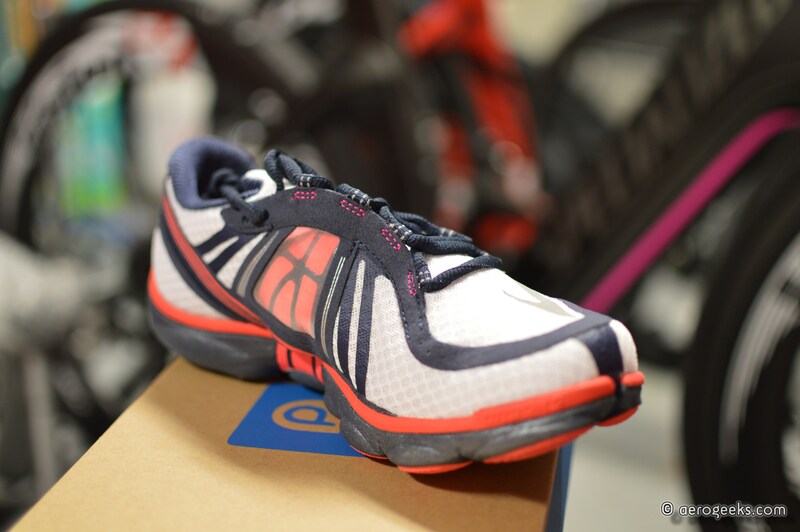 She’s turned to the Brooks Adrenaline GTS for years now, so needless to say, she was pretty stoked to get a chance to put in some mileage with one of the shoes from Brooks’ PureConnect line. 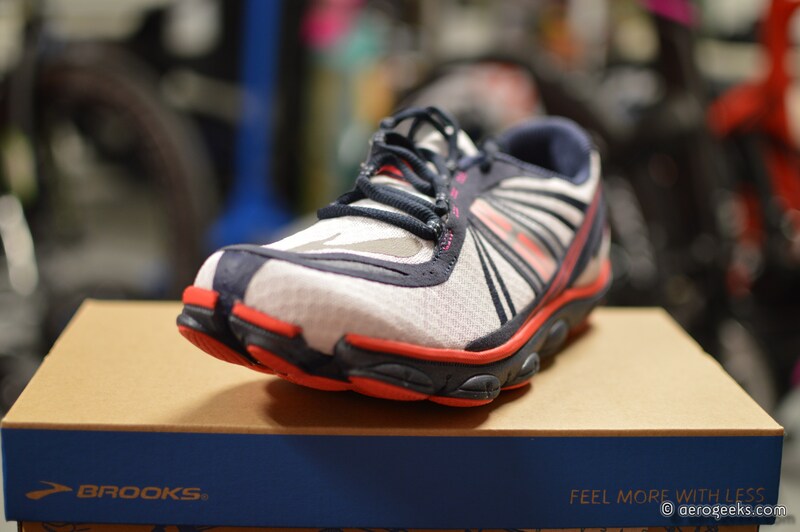 Brooks first launched PureProject, its line of lightweight running shoes, in October of 2011. Since then, we’d heard mixed feedback regarding the PureProject collection—especially regarding the PureConnect 2. 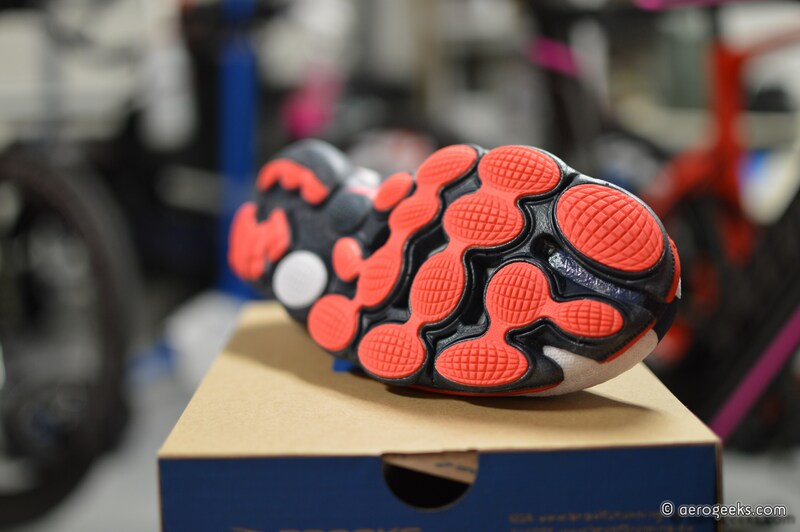 So we were eager to see how Brooks had improved the PureConnect 3 (note: this was actually the first full update of the shoe since its original launch). 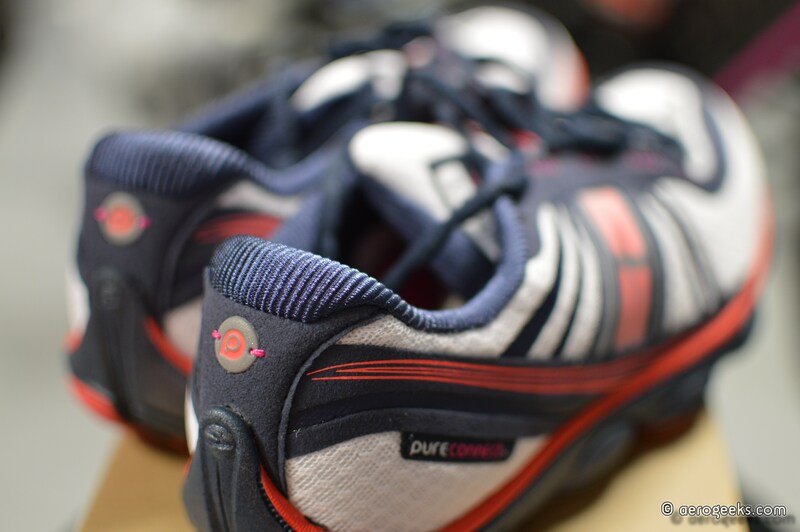 Let’s begin by reviewing one of the biggest complaints we’d heard about the PureConnect 2—the narrow toebox. 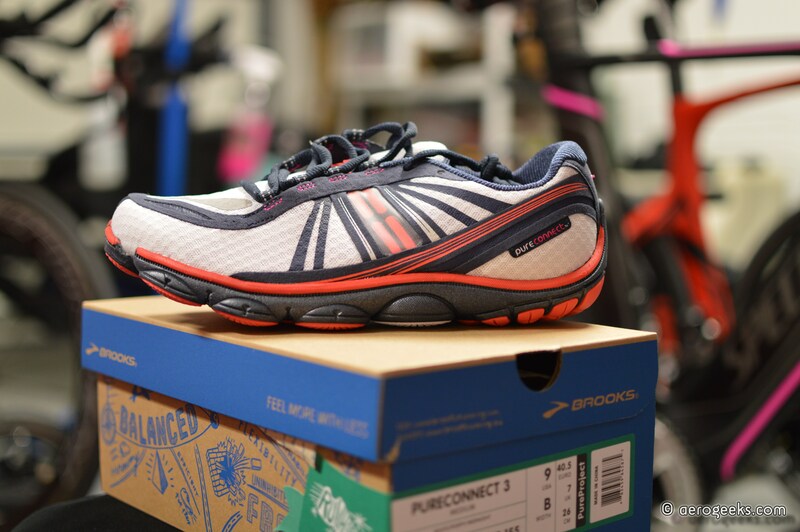 From our experience with the PureConnect 3, we’d say that Brooks heard its customers’ requests and increased the toebox width. Our pair of PureConnect 3s fit like a glove. However, we would caution those with a wider foot that this shoe definitely runs on the narrow side. 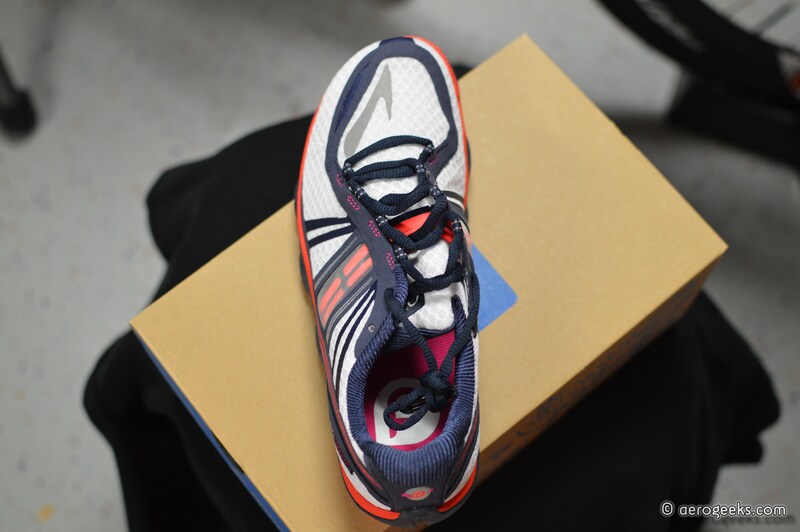 Our multisport editor, who was wearing this shoe throughout the testing period, never felt as though she needed to cinch up the laces very tight to achieve a snug fit. If anything, she left the laces a little looser. Despite the looser lacing due to the slightly narrow fit, the shoes stayed locked in place—never once causing a single hot spot or blister. We likely have Brooks’ asymmetrical lacing and Nav Band technology to thank for this. A flexible, stretchy band, the Nav Band wraps around the wearer’s midfoot to help keep the foot secure throughout the run. While the Nav Band had actually been on the list of modifications from the PureConnect 2 (the band is reported to be wider and changes from fabric to silicone), we still did feel as though the Nav Band could contribute to additional squeeze if you have a wider foot. But for us, we felt that it improved the fit and feel of the shoe. Another note about the shoe’s construction pertains to the upper material and the “burrito-style” tongue. First, we felt as though the shoe’s material (double-layered mesh) could stand to be a bit more breathable. This wasn’t a deal breaker—just a small nitpick. As for the burrito tongue, we did find that it took a little more finagling to get the shoe laced and comfortable. While this did take nothing more than a few added seconds, we would probably not choose the PureConnect 3 as triathlon shoe for race day. We did take the shoes out for a brick and found that the burrito tongue and Nav Band did become more troublesome as fatigue began to set in. Let’s just say a few seconds can easily turn into a few more when you’re exhausted and dripping in sweat. However, we would gladly sport the PureConnect 3 for a 10K or half marathon distance race. We tend to agree with Brooks claims since we could easily forget about the shoes on our feet, which was surprising in a way. 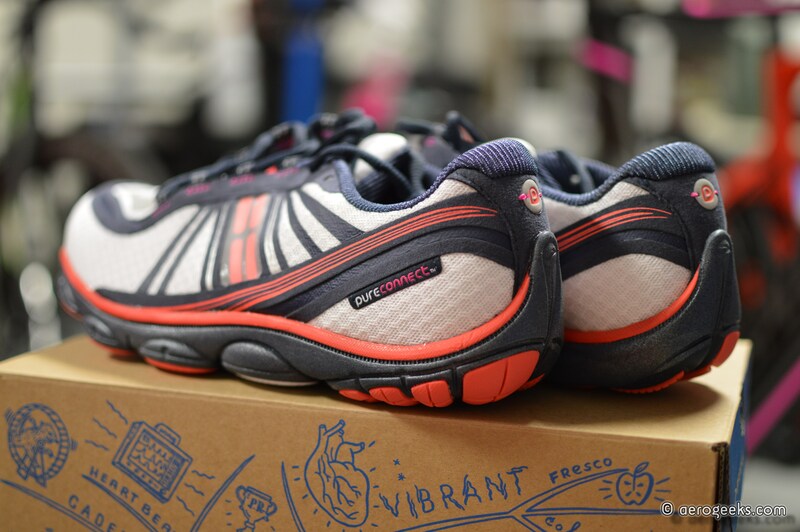 When we first slipped on the PureConnect 3s, we were concerned that the pods (scattered across the sole) felt like a bit too much. Would this hinder the shoe’s flexibility? Would we feel unstable? However, after just a couple runs, we began to realize just how this technology added to the shoe’s appeal. Mile after mile our feet felt adequately supported while never being weighed down. What’s more, it seemed as though the pods provided for additional traction in wet conditions, which is a common occurrence here in South Florida. The PureConnect 3 also features an increased heel bevel (Ideal Heel) to encourage midfoot and forefoot striking. 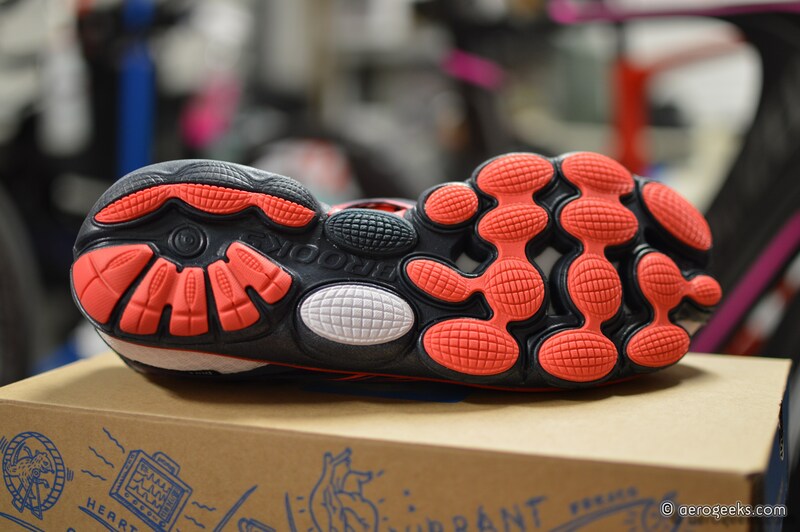 For those familiar with the PureConnect 2, this basically means you’ll see a rounder heel on this version. There is one thing about this shoe that we were never able to quite figure out—the split toe, or “Toe Flex.” According to Brooks, the split-toe feature is supposed to allow the wearer’s first two toes to function separately and engage the runner’s natural gate during toe-off. Honestly, we never really felt anything. Maybe others have, but we didn’t experience any positive or negative impact here. 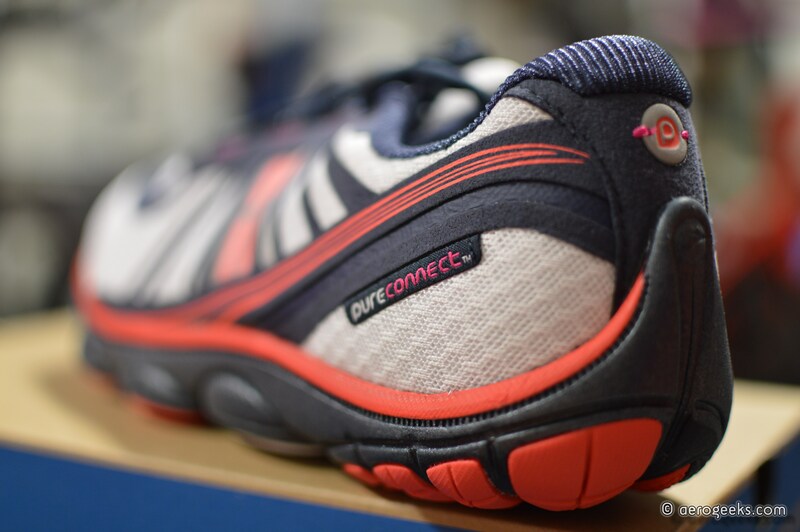 Overall, we enjoyed many miles in the PureConnect 3s. And while we wouldn’t recommend taking these shoes to transition, we’d vouch for putting them on your short list as a primary running shoe. What’s more, the shoe’s $100 price tag is pretty easy on the wallet. I’ve been running in the PureFlow 2’s for about 6 months now, and I ran in the PureConnect 1’s for a year before that. I can honestly say that this is a shoe which gets AMAZINGLY better with elastic laces, especially in T2.